In large bowl, mix beef, bread crumbs, onion, milk, Worcestershire sauce, salt, pepper and egg. Shape mixture into 12 (2-inch) meatballs. In 12-inch skillet, heat oil over medium heat. Add meatballs; cook 6 to 8 minutes, gently turning occasionally, just until browned on all sides. Add pasta sauce and water; heat to simmering. Simmer 8 to 10 minutes, stirring occasionally, until meatballs are thoroughly cooked and no longer pink in center (165°F). Using slotted spoon, transfer meatballs to plate, and cover to keep warm. Stir zucchini noodles into sauce; cook 2 to 4 minutes, stirring gently, until noodles soften. Divide zoodle mixture among 4 bowls. Top with meatballs. Sprinkle with basil and Parmesan cheese. 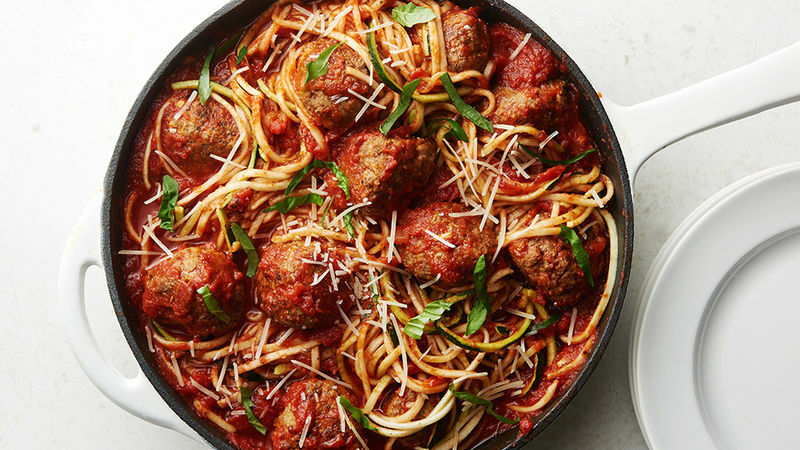 Be careful when adding the water and pasta sauce to the hot skillet with the meatballs. To avoid splattering, pour liquid into pan gently, holding jar and measuring cup close to skillet. Using prespiralized zucchini noodles that are measured in ounce-weights? For this recipe, we used 22 oz of zucchini noodles.